The max heart rate calculator gives you a target. A heart rate to aim for while you're training. The speed and distance each of us can and will run varies wildly, depending on our natural ability, training level, and sport. Heart rates, on the other hand, is a more democratic metric. If your average heart rate while running is in the right zone, you're training well, regardless of your level. Training this way allows you to stay within an optimal yet safe level of exertion, keeping a healthy heart rate while also pushing your limits a little. Knowing how fast your heart is beating, on average, during a training session is a great way to know whether or not you're really pushing yourself. If you cycle hard up a hill in the middle of your routine, but the rest was smooth sailing, you might remember the tough part and forget the rest. Overall, it wasn't enough to trigger real physiological conditioning within your body, but you aren't to know that. The only way to objectively know you are training in a way that will stimulate peak physical conditioning is to record your average heart rate when you train, and use a max heart rate calculator to measure your level of exertion. This sort of conditioning is essential for any endurance sport, and it's also useful for any sport that pushes you to physical extremes. Be sure not to push yourself too close to your maximum heart rate for extended periods of time. If you experience shortness of breath, pain in your chest or joints, or can't work out for as long as you expect, you might need to reduce your training intensity. When training for an event, you should know the different ranges of heart rates, and what they mean. Training in the recovery zone builds a basic foundation of endurance and aerobic capacity. The aerobic zone beefs up your cardiovascular system. In the anaerobic zone you'll hit your "anaerobic threshold", at which point you'll switch on lactic acid system. You'll start to feel the burn! Lastly, training in the red line zone can only be done for short periods, and develops your fast-twitch muscle. Use the target heart rate calculator to know which heart rate would put you in the zone you want. Train with your heart beat monitor and record your average heart rate. Open your max heart rate calculator. See if you trained in the correct range, and what it means. You might also find the pace calculator useful, which tells you how much time you need to run a particular distance. 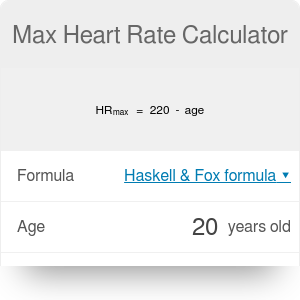 Max Heart Rate Calculator can be embedded on your website to enrich the content you wrote and make it easier for your visitors to understand your message.